Is a new arms race brewing? 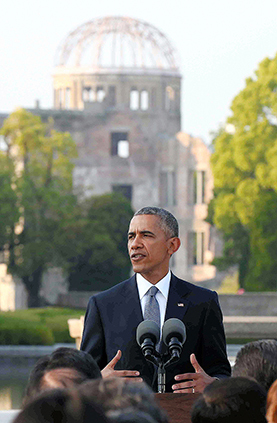 In his first term, President Obama vowed to try to rid the world of nuclear weapons. Now, in his second term, while still hoping for a non-nuclear world, Obama has embarked on a vast plan to modernize the U.S. nuclear arsenal, a step he says is needed to keep the weapons reliable and safe. The effort — aimed at upgrading the nation's launch systems, warheads and the missiles, bombers and submarines that deliver them — could run nearly $350 billion in equipment and operational costs over the next decade and up to $1 trillion by 2050. The move comes amid rising tensions with Russia and China, the world's other top nuclear superpowers, as well as continuing skirmishes between nuclear-armed India and Pakistan and the nuclear ambitions of rogue states such as North Korea and Iran. Advocates of nuclear disarmament say the administration's plan will increase the danger of a nuclear holocaust by encouraging other countries to add to their nuclear stockpiles. But advocates of modernizing the U.S. arsenal say up-to-date and powerful nuclear weapons will discourage hostile nations from attacking the United States.